Although the flight was only 15 minutes long, it was definitely worth it for the spectacular views. I was able to see every hotel pool from above and the neon lights looked even more brilliant than when you’re walking through the strip. The best part was seeing the people in the Stratosphere tower from close up as we flew around it. Body weights of all passengers are required under the “additional notes to the supplier” section during booking, and guests over 275 pounds (19 stone) may be charged an additional seat. Upon check-in all passengers above 18 years of age are required to present a government issued photo I.D. It is a shared activity. Photo credits go to our Ambassadors Anna Everywhere and Two Monkeys Travel Group travel blogs. A stylish way to admire trully special view of the glittering Las Vegas Strip - the highlight of world’s entertainment capital. The locals call it Sin City, but this Tinggly package is a slice of heaven! 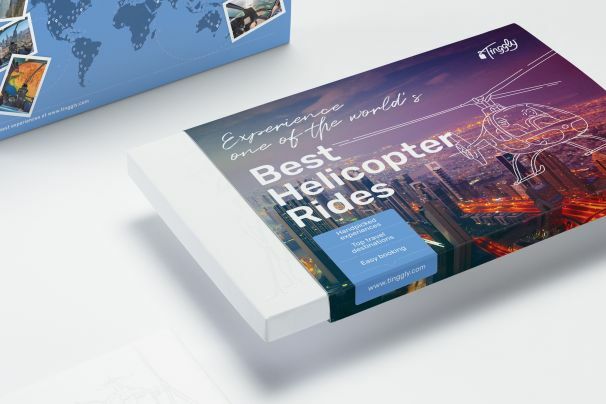 You’ll be given the full red-carpet treatment, picked up from your accommodation in a stretch limousine and transferred to luxury helicopter for a memorable flight above the most famous light show in the world. See the dancing fountains of the Bellagio, the exploding volcano at the Mirage, and circle the Stratosphere Tower, and many other Vegas landmarks on this unique experience. Ideal for a honeymoon, anniversary or, dare we suggest, even a proposal, this sunset tour of the Strip is truly unforgettable, See the city’s legendary lights beneath you, and the dark desert stretching out all around, with the ultimate birds-eye view. We suggest popping some champagne when you get back to your hotel to round off a sublime evening.